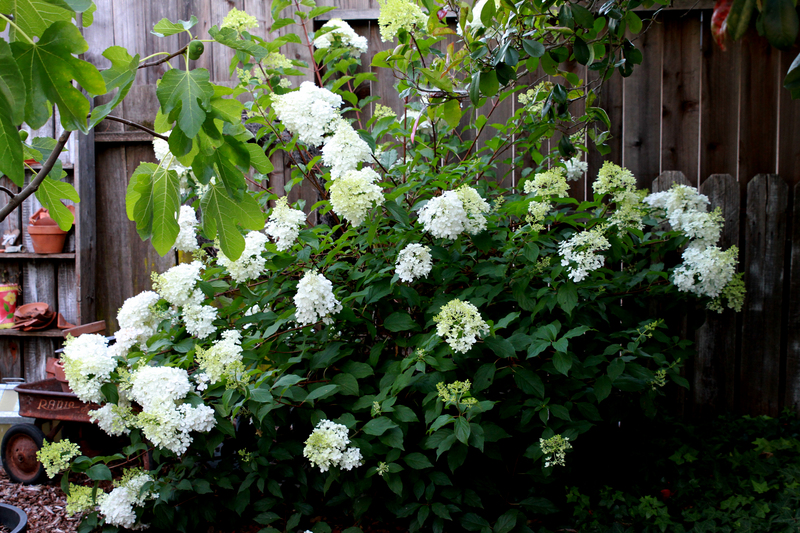 During a fall color trip back East a few years ago we kept seeing what looked like the hydrangeas we grew at home in northern Calif., but different! 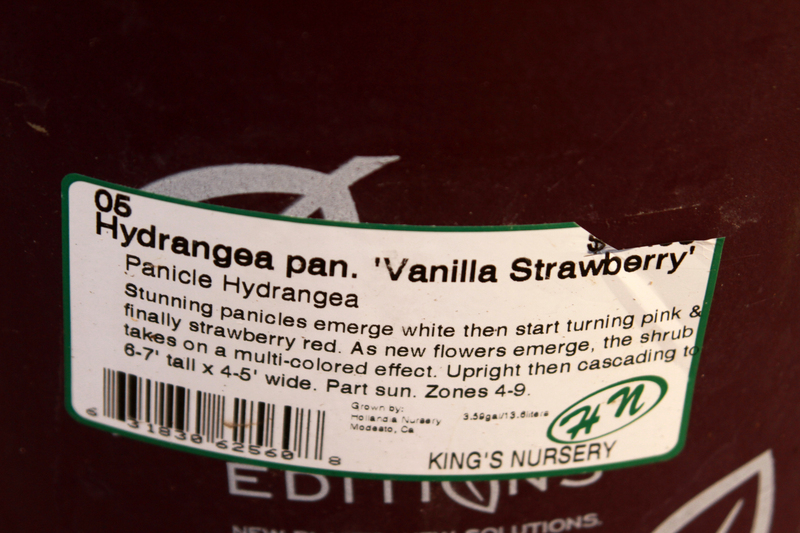 After asking around we found out what we were falling in love with was a paniculata hydrangea named Strawberry Vanilla. A few months later a friend bought one for my birthday! While they take more sun than mop heads in our USDA zone 9, morning sun is still the best. Mine did OK in afternoon sun but eventually it got a little crispy around the edges. 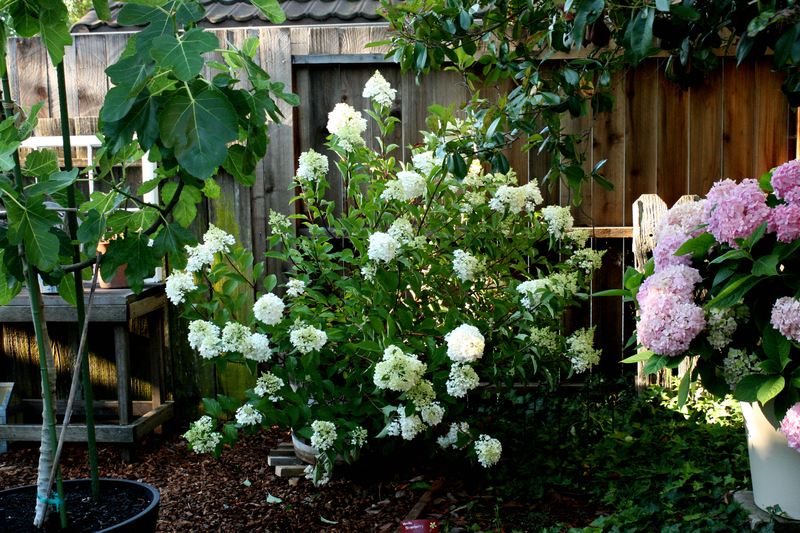 The best thing about these hydrangeas is that they can be pruned way back every year and it just makes them grow and bloom more! From a 3 gal. can mine has grown to nearly 5.5 ft across! It now sits in its bottomless wine barrel in a spot with morning sun and perhaps a little too much shade on one side. You can tell when they lean hard toward the sunny side that you haven’t yet found the perfect spot. 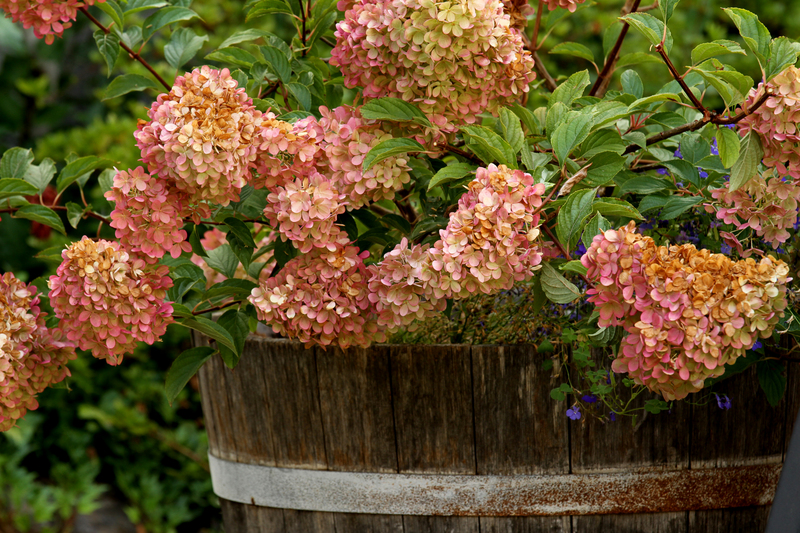 Like most hydrangeas they like plenty of water and they change color as they age. 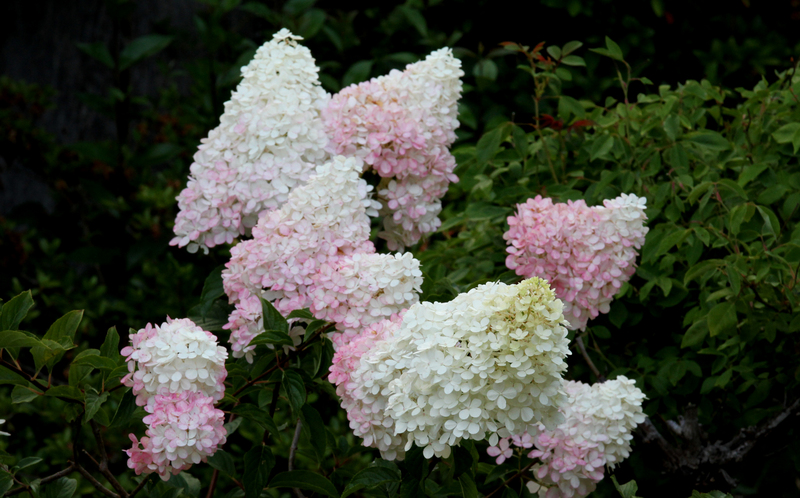 They begin a bright Yellowish white and fade to a rosy pink….beautiful in every stage. 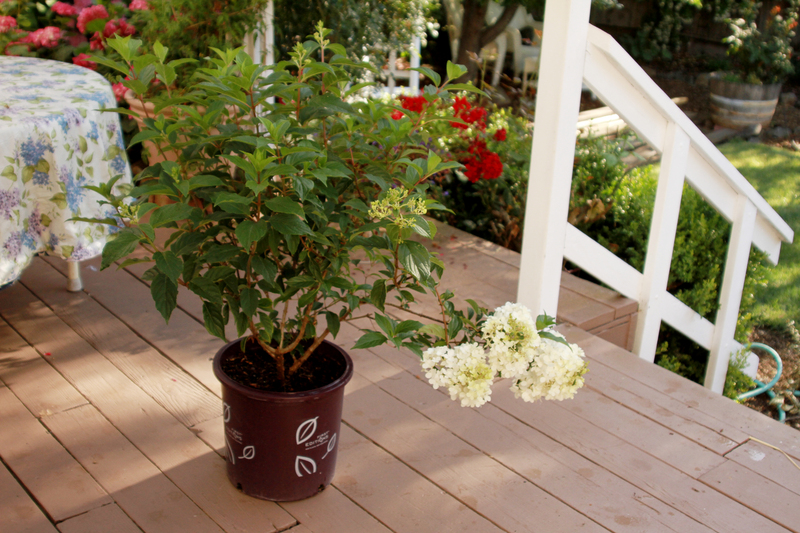 I give regular Miracle Gro once in early spring and then Miracle Gro Bloom once or twice during summer. It’s important to switch away from high nitrogen so you don’t end up with all plant and no flowers! The blossoms make fine long lasting cut flowers and though not as reliable as mop heads when dried, they can be used that way as well. Back East we saw many of them trimmed up into high trees. I like the look of a big full bush so I didn’t try that with mine. Even with the hard frosts we had last year my bush came back beautifully this spring so I’d say it’s doing very well here though it’s generally suggested for zones 7-8. Right now it’s 6 feet across and 5 feet high! 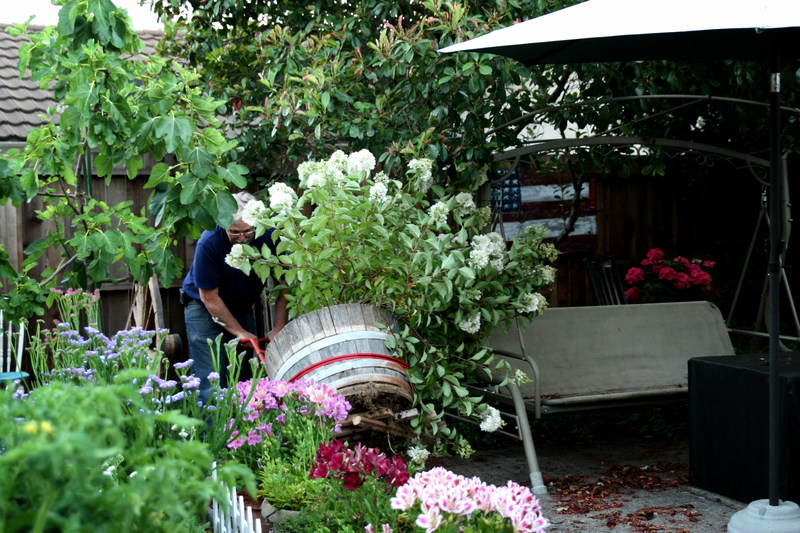 You can let the flowers hang on throughout the winter then prune the plant back by as much as a third in early spring. You will be rewarded with a huge new burst of bloom! 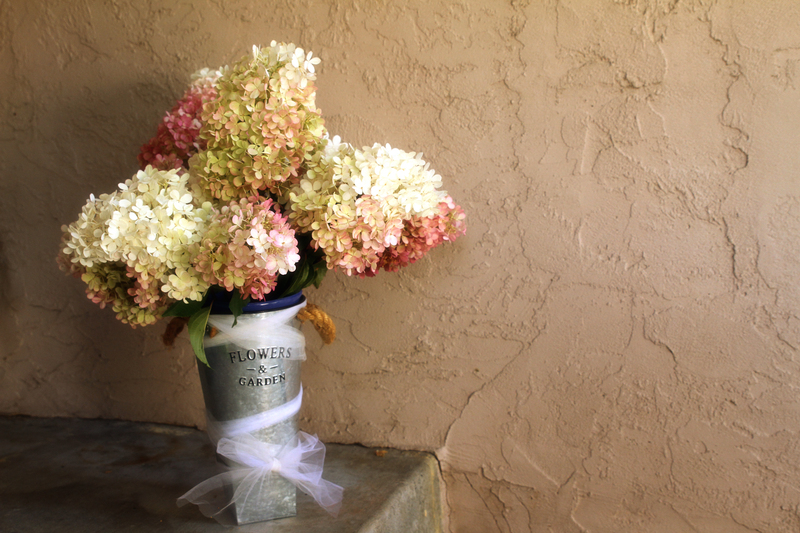 If you want to expand your hydrangea collection this is a good one! So what do you think? Do you grow them? Would you like to? Please share! 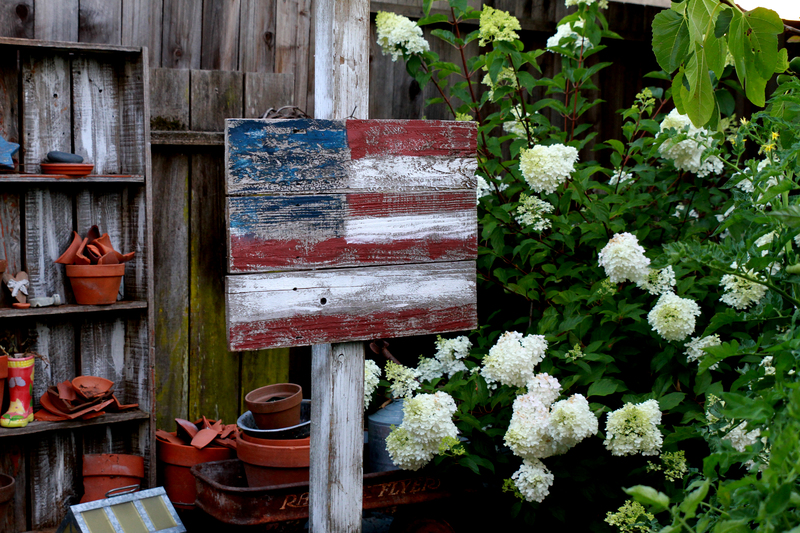 ← Gaddis Wholesale Nursery…Preparing Plants for Our Gardens!